Captain Sparrow continues the “Pirates” saga on his quest to find the Fountain of Youth. Instead of co-stars Orlando Bloom and Keira Knightley from the first three films, Penelope Cruz steps in as Angelica, who happens to be searching for the same treasure. Many thought the third movie, “Pirates of the Caribbean: At World’s End,” was going to be the last. 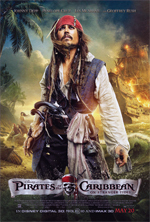 However, at the very end the crew of the infamous Black Pearl agrees to search for and bring Captain Jack back. From capturing a mermaid to trekking through the jungle, the film provides the usual sense of humorous suspense. Jack starts off in London rescuing his former first mate, Mr. Gibbs, out of prison but they soon find themselves back in King George II’s hold. Here they reunite with the newly appointed Privateer Barbossa who is also seeking the fountain under the king’s order. It takes time for the film to get into the actual search for the fountain, but once it does, there are thrilling surprises around every corner. If one is looking for a nice way to spend an afternoon, catching the film in either 2- or 3-D will leave one feeling almost slightly dangerous in a pirate, trust-no-one kind of way. With the all too familiar cliffhanger end to the more than two-hour movie, there is no end in sight for this beyond-brilliant saga.